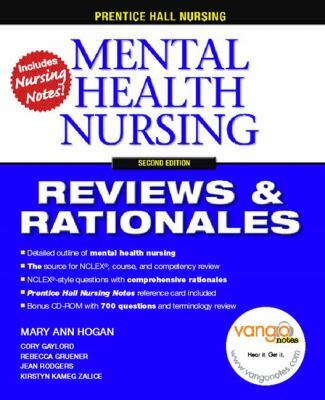 Essential for course review and NCLEX review, this resource is a complete, concentrated outline of mental health nursing. Content includes all of the "need-to-know" information covering therapeutic communication, developmental disorders, mood disorders, anxiety disorders, somatoform disorders, dissociative disorders, personality disorders, schizophrenia and psychotic disorders, cognitive mental disorders, substance abuse, crisis intervention and suicide, death and dying, and much more. Each chapter provides the following tools that will help lead you to success in your course and on the NCLEX-RN: Chapter Objectives Pre- and post-chapter tests with comprehensive rationales New test-taking strategies Vocabulary review Practice-to-Pass exercises Critical thinking case studies NCLEX alerts Prentice Hall Nursing Notes reference card CD-ROM with 700 practice questions About the Series Prentice Hall's Nursing Review & Rationales Series is the complete foundation for success within the classroom, in clinical settings and on the NCLEX-RN exam. Each topical volume offers a concentrated review of core content from across the nursing curriculum, while providing hundreds of practice questions and comprehensive rationales. The only review series offering a tear-out reference card and additional audio reviews, the complete series includes the following volumes: Nursing Fundamentals Anatomy & Physiology Child Health Nursing Fluids, Electrolytes, & Acid-Base Balance Maternal-Newborn Nursing Medical-Surgical Nursing Mental Health Nursing Nutrition & Diet Therapy Pathophysiology Pharmacology Physical Assessment Community Health Nursing Leadership & Management Comprehensive Review for NCLEX-RN Comprehensive Review for NCLEX-PNHogan, Mary Ann is the author of 'Prentice Hall Nursing Reviews & Rationales Mental Health Nursing Reviews & Rationales', published 2007 under ISBN 9780132240772 and ISBN 0132240777.